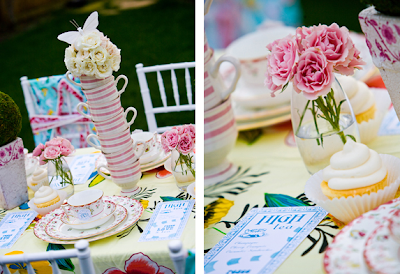 Juneberry Lane: High Tea: Whimsical & Elegant . . .
Now that Spring is in full swing, what better way to delight in all of this warm weather than to sit outside with your friends & enjoy the fresh air. This fanciful, bright, and playful tea party is sure to shake off any remaining wintery blues and fill your soul with sunshine . . .
What a wonderful way to add color & life to your backyard and to use up any spare, mismatched fabrics that you may have lying around. Now brew up a fresh pot of herbal tea, chill up your mini bottles of crisp champagne, and get outside & have some fun!